FANBOY PLANET.com . : mc-darkriver :. If you spend a day in London, you will be photographed no fewer than 200 times. As a paranoid Alan Moore noted in V For Vendetta, cameras are everywhere. If you believe author John Twelve Hawks, it's all part of "the Vast Machine," the culmination of a millennial struggle between two ancient secret societies that will leave us with no private lives or possibly even private thoughts. 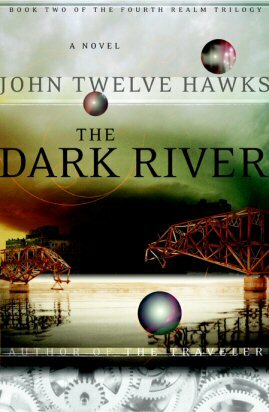 Okay, Twelve Hawks admits to writing fiction, but his latest novel, The Dark River has enough elements of reality in it to make it a more than slightly uncomfortable read. That's as it should be, as this stew of science fiction and new age mysticism posits a world not too far from our own - in fact, it can't be much more than five minutes into the future. The second book in a trilogy called "The Fourth Realm," The Dark River still flows pretty easily if you haven't read the first book, The Traveler. Though a few early passages seem clunky as Twelve Hawks gets readers up to speed, that's more because the publisher Doubleday had already lifted them out and put them in a preface. Left to its own rhythms, this novel sort of sneaks up on you. Opening in a small community that prides itself on living "off the grid," it would seem that The Dark River might be about the struggles of trying to be a utopia in a dystopian world. The people of New Harmony follow the teachings of Matthew Corrigan, one of the last "Travelers." All should be well as they grow their own food, get along with their neighbors, and naturally do a lot of arts and crafts. Unfortunately, these government helicopters are on their way. In the first of Twelve Hawks' genuinely creepy touches, they're loaded with soldiers who have taken a pre-traumatic stress pill, aka Pits, that keeps them from ever feeling guilt about slaughtering innocents. If the government isn't developing such a thing right now, you know it's only a matter of time. For New Harmony, it's over before the story can even begin. A secret cabal calling themselves The Brethren want to stamp out all traces of the Travelers. The Brethren's enemies call them The Tabula, for they see humanity as a blank slate upon which they can write fear and order. Unfortunately for those enemies, The Brethren have pretty much taken over. Our only hope would be the Travelers, men capable of transporting their consciousness from Earth, the Fourth Realm, into one of six other realms. They can then bring back teachings of peace and light and it's really not as preachy as it sounds. Though sometimes it's a narrow escape, Twelve Hawks does keep avoiding the trap of stopping and lecturing the reader about philosophy. Instead, you can glean a few messages from characters' behavior, most dramatically through the warrior society pledged to protect the Travelers. Inexplicably labeled Harlequins, these soldiers of the spirit forsake love for duty, and as the novel progresses, that gets examined from a lot of different angles. It isn't just the reader noticing some sort of irony in these emotionless people trying to protect love. Twelve Hawks cleverly ties in a lot of action. Nobody has much time to moralize, as the Tabula works on its Shadow program that keeps tabs on you through a virtual avatar. To stop it, nascent Traveler Gabriel joins forces with a band of Free Runners and …well, they're just as exciting to read about as they are to watch in action. Since Twelve Hawks talks a lot about other Realms, he has to let us visit, too. Though he keeps the violence fairly circumspect, he has created a pretty disturbing vision of Hell, the First Realm, and by the time that gets introduced, you'll have been hooked for a while. Though it was easy to get into the novel without having read the first book, reaching the end will be difficult, because you know it's going to be a while before the third book. Before you buy the book, also check out John Twelve Hawks' website, which is full of resources to help you up your social awareness -- and sense of responsibility.